Nicky C, award-winning DJ and musician, adds another feather to his cap in the long-awaited solo exhibition this August. In his second solo exhibition which runs from 15th August till 15th September 2014, Nicholas Choong showcases 46 brand new art works at the Atelier Art Space at Jaya One, Petaling Jaya. 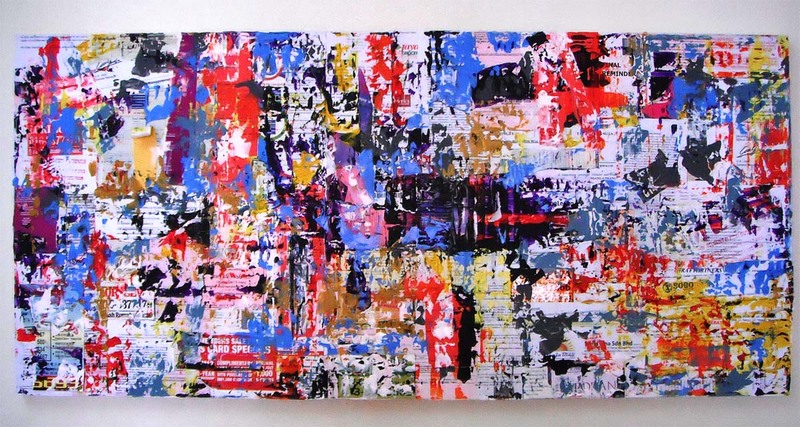 Departing from familiar medium and his trademark landscape works, Nicholas explores the world of abstracts, drawing influences through extensive research of the masters of abstract art Jackson Pollock, Rothko and Gerard Richter. 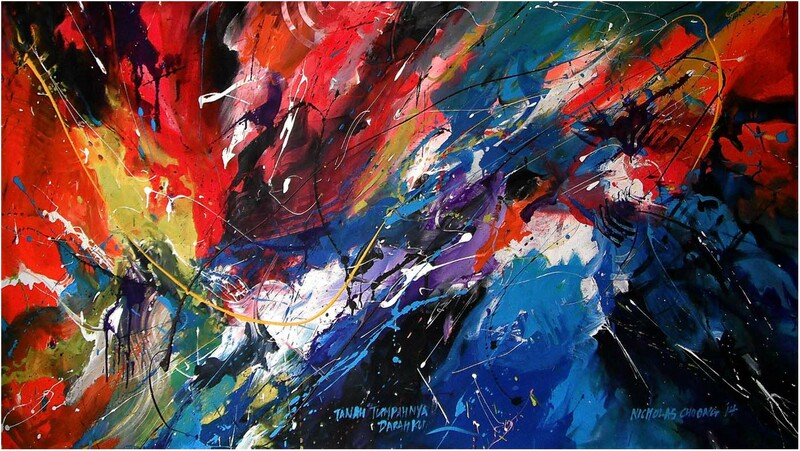 The 16 medium and large abstracts are free floating and vibrant, attracting various points of view, interpretations and impressions, which is the focal point of Nicholas’ journey in abstract art – to invite the audience to take the time to appreciate what is being presented, to let their vision drive meaning; rather than the mind dictate what they see. In his quest for challenge, Nicholas puts together 30 pieces of 3D collaged sculptures, each representing a day and a story in itself. The collages have received favourable responses. Actual objects are mixed and matched, creating symmetry and balance despite appearing like random items coming from various sources. The collages are displayed in windowed wooden boxes, giving the audience a sense of relevance to the real world. These are after all, daily objects that you would see everywhere – except that they are now placed on display. What can you make of it now? These 3D collages not only represent the everyday, but also the current period – 30 days in his life in the 21st century. Nicky grew up with art and music. He studied drawing, water colours, woodcarving and collage making at an early age. When he started working in the mid-90s, he developed more skills in music, entertainment, photography and graphic design. After an illustrious career in the music industry as a DJ, he started to focus on developing his artistic talent in 2011. This was a timely change as it also allowed him to manage family life by working from home and spending time with his son. “It is never easy for one to follow his/her internal path. But if there’s a will, there’s a way”. Nicky’s art works now grace the galleries and homes of private collectors all over the world. To name a few – London, Germany, Italy, New York, Singapore, South Korea, and of course, Malaysia. Taking pride in being a PJ-lad, Nicky looks forward to this show being held in his home ground. “This show means a lot to me because PJ was where I grew up and learnt the arts. So I feel happy returning some “PJ” back to the community. Also, this is a great chance to create some good memories with some good friends (also PJ-folks, mind you) and to push young local art and music forward”. Nicholas Choong- SOLO is managed by Elias Projects, a project management firm led by James Yip and Lee Suan Tan – the dynamic duo who provide business consultancy and project management expertise. Elias Projects together with Hotel Sun Lun Yik and Chalk and Raddy, are partners of sembilan Art Residency – a boutique art residency located in the charming town of Seremban, Negeri Sembilan. sembilan launches in September 2014. Chalk and Raddy is proud to be part of this exhibition, and we look forward to more collaborations in the future. Posted on July 26, 2014 by ChalkandRaddyPosted in Visual ArtTagged Art Malaysia, Atelier Art Space, Chalk and Raddy, elias projects, Emerging artist Malaysia, Nicholas Choong, Nicholas Choong- SOLO exhibition, Nicky C, Petaling Jaya Art.